A Destination Experience for All Seasons Exceptional and enriching family experiences will be a hallmark of community life at Golden Oak. Your choices to make the most of your quality time here will be plentiful. Get an inside look at the magic that awaits you as a Golden Oak Club member. Nothing can compare to living the magic—and membership in the Golden Oak Club is one of the fantastic reasons why. That’s because the Club is all about having friends in fun places! Count on the Club for premier Disney-designed experiences and services at Golden Oak, Walt Disney World Resort and beyond. And with 2019 comes the momentous unveiling of our completed Summerhouse expansion, exciting Club events throughout the year, and more! You'll enjoy extra smiles with our array of services, benefits, special offers, events and experiences. 2019 Club Life features the best-ever package of Disney-designed experiences, services and extras that Golden Oak Club members can enjoy. See you at the Club! 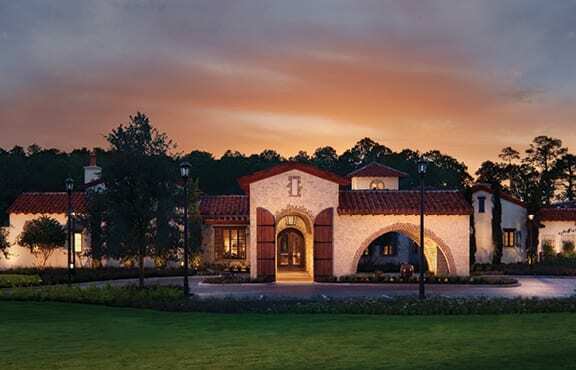 The casually elegant and well-appointed Summerhouse, Golden Oak's private clubhouse, shines as the centerpiece of community activities and events—as well as the home of Club Member Services. Enjoy having the renowned Disney guest service culture as a part of your everyday life here. Our dedicated Club Member Services team can orchestrate your Want To's and Must Do's into Well Dones. Throughout the year, the Golden Oak Club hosts an engaging slate of social, recreational and Park experiences for members to enjoy as a group with family, friends and neighbors. These take place within the Golden Oak community and throughout Walt Disney World Resort, as well as around Central Florida and to points beyond. These don't-miss occasions—often with a special theme or seasonal focus—are creatively selected and arranged by the Club Member Services team to showcase popular attractions, hidden treasures and magical new offerings. Some resident events are included in membership in the Golden Oak Club, while others are available for an additional fee. Enjoy a world of magic and memories with the Golden Oak Member Pass! In association with Disney Vacation Development, Inc., Golden Oak Club members can enjoy some of the expansive, ever-changing array of services, benefits and special offers, events, and experiences that Disney Vacation Club Members can enjoy. Dial up the fun in and around Walt Disney World Resort. The Golden Oak Club is a private social and recreational club for the enjoyment of members and their guests. Each homeowner of Golden Oak is required to be a member of the Club. Many of the described benefits and services are included in membership in the Golden Oak Club, while others are available for an additional fee. Subject to the terms below and except as otherwise provided, all of the enclosed elements, offers, amenities, entitlements, benefits, privileges and services that comprise the 2019 Club Life are valid for 2019 only and expire on December 31, 2019. An updated and revised Club Life will be available to all Golden Oak Residents on January 1, 2020. Golden Oak Development, LLC, Walt Disney Parks and Resorts U.S., Inc., and their affiliates make no commitment that the elements, offers, amenities, entitlements, benefits, privileges and services that comprise the 2019 Club Life will be included in the updated and revised 2020 Club Life. Golden Oak Club amenities, benefits and services are subject to change or termination without notice, may require the payment of a fee, and are subject to availability and blockout dates may apply. Any offers, amenities, benefits, privileges and services offered or provided by third parties other than the Golden Oak Club and its owner and operator (e.g., Disney Vacation Development, Inc. or the owners or operators of Four Seasons Resort) are subject to change or termination without notice at the discretion of such offering or providing party, may require the payment of a fee, and are subject to availability and blockout dates may apply. You should not purchase a real estate interest in Golden Oak in reliance upon the continued availability, renewal or extension of these offers, amenities, benefits, privileges and services offered or provided by these third parties, nor upon the continued availability, renewal or extension of any of the specific amenities, benefits or services of the Golden Oak Club.